In this busy and competitive world, parents always want their children to excel in everything, especially in academics. Sometimes, parents push their children too much to the extent of hurting and suppressing them. 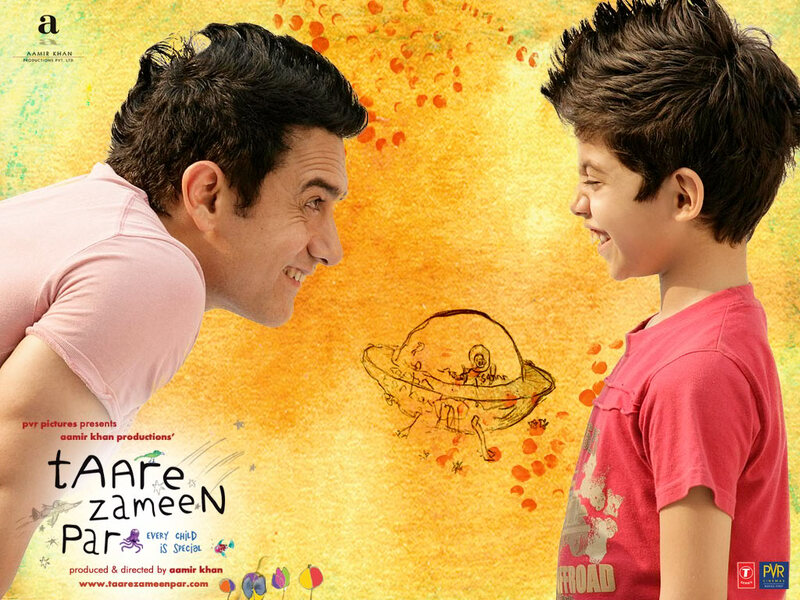 Recently, I've watched a very heart warming film about a boy (Ishaan) who is suffering from dyslexia. It's a Bollywood film directed by Aamir Kahn of 3 idiots. It's called Taare Zameen Par (Every Child is Special). The movie showed how a child was ridiculed and unappreciated because of his inability to read and write, but still managed to cope up and become an outstanding student with the help of his passionate teacher. I don't know how to express my emotions when I was watching the movie. 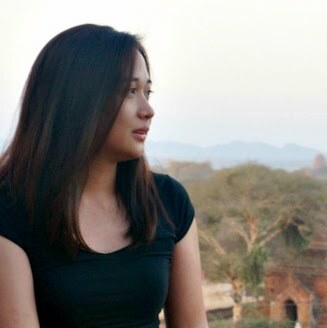 I was teary eyed on most part of the film and I admit, it really captured my heart. It's an intelligent and very touching movie. It entertains and enlightens at the same time. 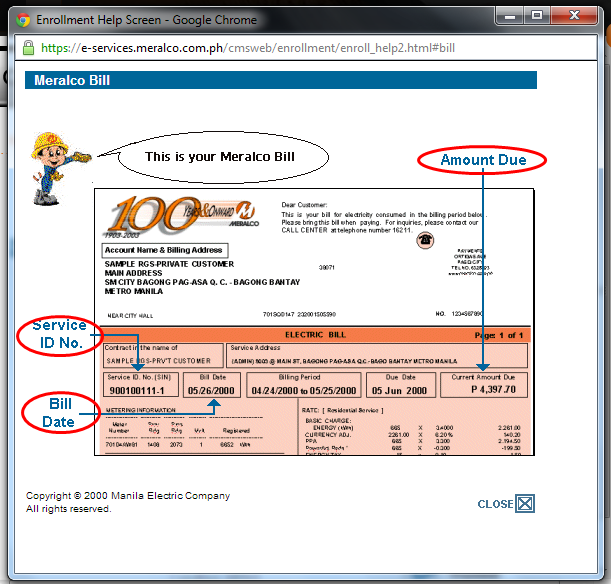 Did you know that you can now view and pay your MERALCO bill online? 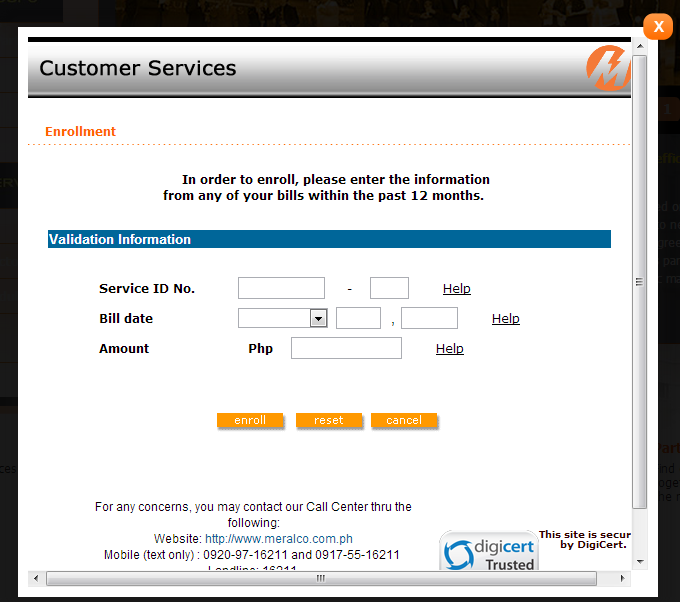 MERALCO (www.meralco.com.ph) has an online account and electronic billing system. It's called the Meralco E Bill system. Through this system, you can review your service information, check complaints status, inquire on bill history, send comments and suggestions and most importantly, receive email notifications of your monthly bills. 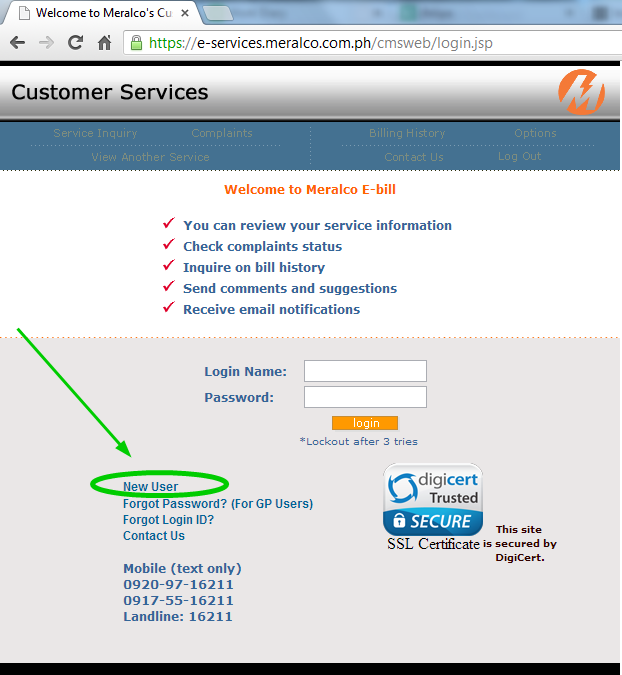 Why subscribe to Meralco E-Bill? The MERALCO E-Bill is an easy, convenient and secure way to view and monitor your monthly MERALCO electric bill online. To create an account with MERALCO E-Bill, go to the MERALCO website at https://e-services.meralco.com.ph/cmsweb/login.jsp. Step 1: Select New User. 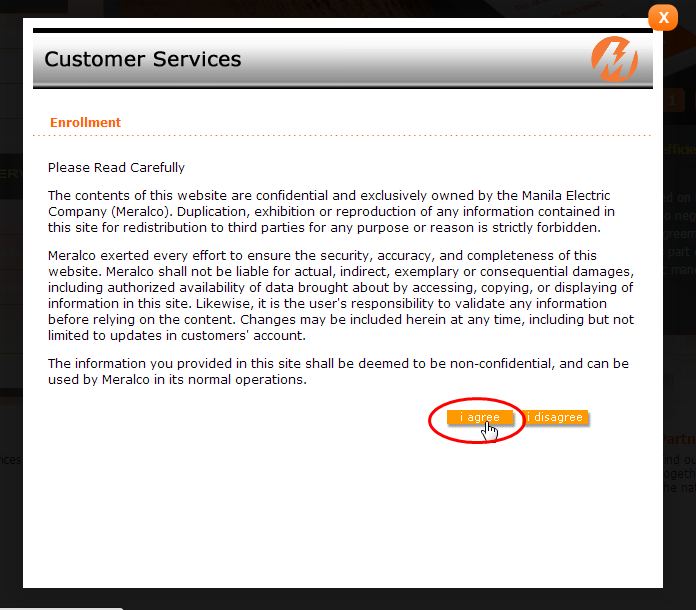 Read and Accept MERALCO's terms and conditions by clicking I Agree. If you're unsure where to locate the information in your bill, click "Help" to view the sample bill. Enter the required information and click Enroll. Fill out the User Information page and create your username and password. Also, you may choose to receive notifications of your bill via email, just select the first checkbox and enter your email address. Check your inbox for the email confirmation. Once your information is validated and confirmed, you can start using the service right away. Pretty easy, right? You just need to create a free MERALCO E-Bill online account to manage your MERALCO online bill easily. My favorite feature of the Meralco E Bill system is the email notification of my monthly bill. I've been receiving monthly email alerts for our MERALCO bill since February 2012 and I haven't missed any payments since then. I am able to check the exact bill amount and process payment through BPI Express Online as soon as I receive the email notification. Cool, isn't it? If your bank is a member of Bancnet, you can also pay your MERALCO bill online. Also, you can pay your MERALCO BILL online if you have an online account with the following Banks, BDO, BPI, Chinabank, Metrobank, PNB, RCBC, UCPB & Unionbank. Note: You will still receive a paper copy of your bills even if you're enrolled in MERALCO e bill. I think you'd agree with me when I say that unnecessary queueing is a waste of time. It makes us less productive and it eats up time that could have been used in activities that are more worthwhile. So if there are smarter alternatives or more efficient ways of doing things, then I'd definitely choose the better workaround. Like paying utility bills online. Why do we need to physically go to a payment center and wait in line when we can do it online? It's such a relief that most banks offer internet banking now. Internet banking has an efficient bills payment facility that account holders can use to expedite payment transactions. Take BPI Expressonline as an example. Paying bills is just a few clicks away with BPI Express Online. I've been using BPI Express Online in paying utility bills (MERALCO, Manila Water and Globe Telecoms) for over 5 years now and I can say that it's really efficient. There's no mo more waiting in line and no more wasted time. You can benefit from this popular internet banking feature too. If you're a BPI account holder, the first thing you have to do is to register and activate your BPI Express Online account. HERE'S HOW YOU CAN REGISTER & ACTIVATE YOUR BPI ONLINE BANKING ACCOUNT. Once you've activated your BPI Express Online Account, you can now use its internet banking services particularly the Bills Payment facility. Make sure to enroll your merchants first so that you can process payments easily in the future. STEP 1: Go to http://www.bpiexpressonline.com/ and log-in to your BPI Express Online account. STEP 2: Go to Payments & Reloading tab, hover over Bills Payment and click Enroll All Other Bills. STEP 3: Fill out the enrollment form by providing the required information. Select your account where amount to be paid will be debited. Choose Manila Electric Company (MERALC) from the Company Name. Input the Reference number. Make sure that it contains your MERALCO Service ID number. A confirmation page appears after a successful merchant enrollment. This serves as the reference of your transaction. After enrollment, you can pay for your Meralco bill online right away! STEP 1: Go to Payments & Reloading tab, hover over Bills Payment and click Pay Bills Today. STEP 2: Input the necessary information on the merchant to be paid. Choose MERALCO from the enrolled bills. Enter the last 5 digits of ATM/Phone Reference No. located at the lower left portion of your bill. Take note that you need to input the exact TOTAL CURRENT AMOUNT reflected in your MERALCO bill. Double check the entered information and click "Submit"
A payment confirmation page appears after a successful bill payment. Check your email for a copy of the payment confirmation. You can also view your transactions for the day, through your My Portfolio > Account Details page. Here's a confirmation message sent to my email account right after the successful payment transaction. Aside from Meralco, you can also pay other bills and other things online, (tuition fees, loans.. you name it) just check if it is listed in BPI's merchant list. Here's the Complete List of Bills Payment Merchants. Paying bills electronically does not only save you time, it also makes your record keeping organized. All your payment transactions can be accessed under your account and you can review them almost 24/7 online. If you have a BPI account and you want to experience a new and convenient way of banking, then you better enroll for BPI Online Banking. BPI Express Online offers you 24/7 full control of your finances. You don't need to wait for long queues in the banks and payment centers just to pay your bills or transfer funds. It’s very simple, easy to use and hassle free. With BPI Express Online, your computer becomes your own personal banking center. Above all, access to BPI Express Online is FREE of charge. Isn't that great? Here are the steps for BPI Express Online Enrollment. 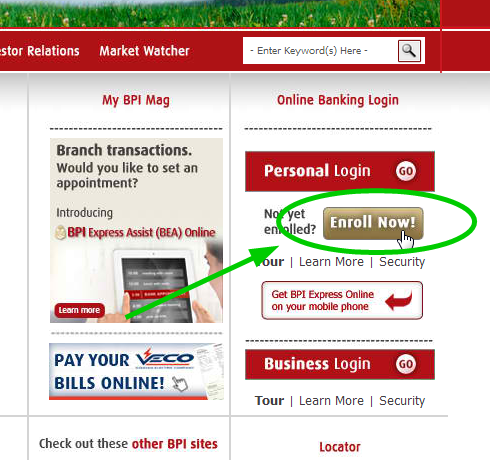 Step 1: Visit the BPI Express Online website at http://www.bpiexpressonline.com/ and follow the initial instructions for the enrollment. A new page will appear and will ask you to choose your account type. Select your account type accordingly and click "Continue"
You will be asked to choose whether you reside "within" or "outside" the Philippines. Each option corresponds to a different enrollment process. If you’re in the Philippines, you must visit any BPI Express Teller ATM within 20 banking days to activate your BPI Online enrollment. 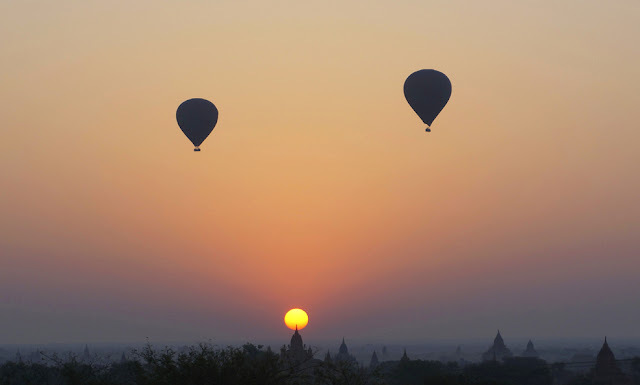 If you’re out of the country, you need to print, sign and mail the duly accomplished form. Note: The process written in this post is applicable for account users residing within the Philippines only. After that, you need to read and understand the BPI's Internet Banking Service Agreement. Scroll down and click "I agree", of course if you agree. Step 2: Fill out the BPI Express Online Enrollment form. Enter your Account Number, Joint Account Indicator (JAI) and choose the Type of your Account. Then click "Submit". After that, create your desired username and password. Remember to keep your login credentials securely because you need that in accesing your account once it has been activated. An email confirmation and instruction to finally activate your BPI Express Online Account via ATM will be sent to your email address once you've completed the initial process for the enrollment request. Step 3: Activate your BPI Express Online Account through the ATM. Your BPI express online account enrollment request will be completed a day after you activated your account through the ATM. After that, you may now login to your BPI Online Account using your nominated user ID and password and access BPI Express Online services. 24/7 online banking is possible with BPI Express Online. I've been using it for two years and I am very happy with its services. I can make payments as soon as I receive my bills and I can check my account balance anytime. If you are a BPI customer then you can benefit from this service too! All you need is a computer and internet connection. Truly a new and hassle-free way of banking.